Oh, this is a hard book to review and I know that I won’t make it justice so I won’t even try that much. Because it is so complex and beautiful, and the characters are amazing and smart and funny, and the drama is not overwhelming (oh, well… it is, but in a good way), and the story makes you laugh and shudder (and some say that they even cried – later edit: the first time I didn’t, I guess I was in too much of a shock for that to happen), and you say ‘wow’ a lot of times, and when you think that you have it all figured out something changes drastically, and your head is spinning around from so much information but you just enjoy it more and keep reading until the end and then you say ‘wow’ again. I was told that the beginning was hard and they were right about it. For many, many pages I didn’t know about the 3 perspective thing (dream/present/past) and there were so many characters and I felt so lost, but the writing was so good and kept me reading so I don’t regret even that part. Then I understood and there were things that I even knew before the character found about them, but there were plenty of other surprises too so it didn’t feel that predicable at all. Some say that this book changed their world, I won’t lie, it didn’t – but it won my heart, slowly it became part of my being. I can’t imagine a world without this book – it was a really great book and it deserves a lot more than 5 stars. Note: A Romanian version of the review can be found here. 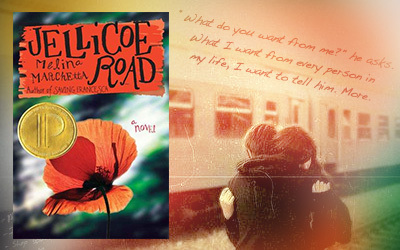 UPDATE: I’ve decided to write a full review for this book and I featured it separately: Review: On The Jellicoe Road [re-read] as there was too much to say, too much love to spread.
. It feels like delivering heart on a silver platter, all I hope is that you could feel the same while reading the book, because this story is simply that awesome! Reading (at least one of) Marchetta’s stories should be one of the “10 things to do in your lifetime”. Seriously, this woman is one of the most creative people alive, one of the most amazing writers I came across and I wish I could put into words the actual awesomeness of this book, but I feel a bit at a loss for words – well, once again. Awesome review! You made me want to pick up a copy ASAP! This one was … quirky, I suppose. It’s been a while, but I remember constantly thinking that I’ve never read a book like this, written like this, about things like this. Just reading the synopsis I knew I had to read it. And I fell in love so bad … To think it took Finnikin of the Rock to get me to read this … Wait … Aw man, that’s up here too. Both of these books could get quite harsh, Finnikin more than Jellicoe, but still. But both didn’t flaunt it, as books about, uh (avoiding the spoiler minefield here) certain of these subjects often seem to do. My quest for a voidfiller is meeting some well known bumps here 😉 I can’t re-read Finnikin or Jellicoe Road again can I? I’m usually REALLY not a re-reader but these two made the exceptions list. Twice. 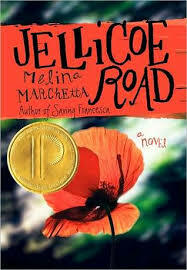 I started my Marchetta-love phase with Jellicoe and it is still my favorite for some reason. But the other series is quite as strong, probably even more imaginative and the plot and characters just as well developed. I am a big fan here, as you can see! I can’t wait for the rest of the secondary review. Yes, you are right. This is my favorite book in the whole world and I feel that I love it a bit more every time I get to read it.